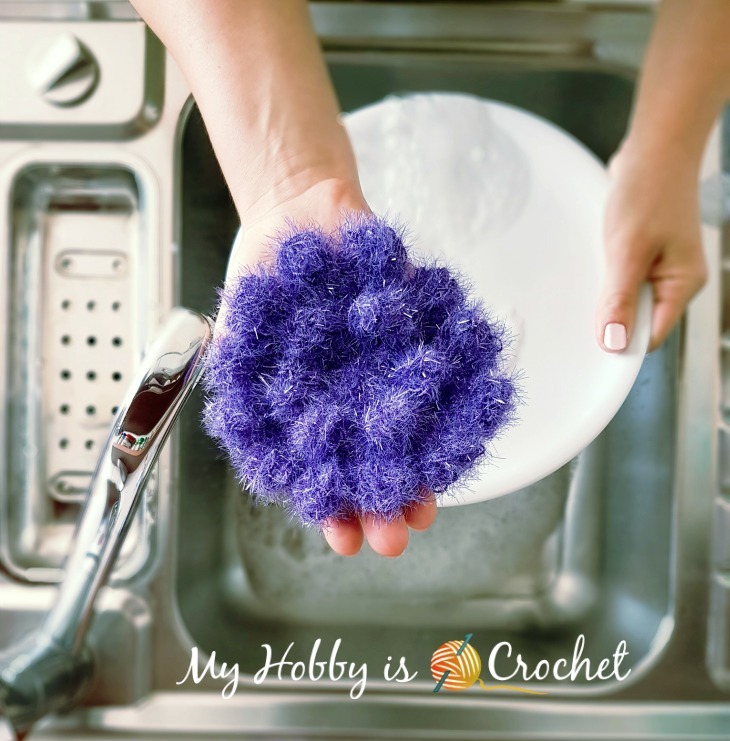 Get rid of your kitchen sponges and crochet a scrubby instead! 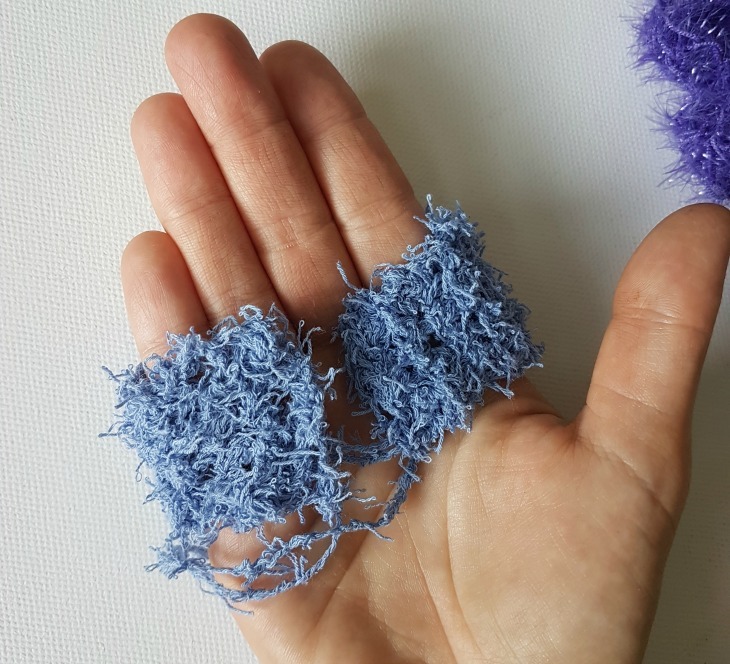 This Dahlia Palm Scrubby is not only so much prettier as a sponge, but it's also machine washable, helping you keep the bacterias away. Not to mention that it works up fast and that you can make several scrubbies from one skein of yarn! 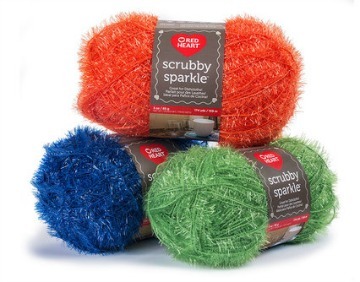 TIP: Don’t be afraid to try the Scrubby Sparkle yarn! It is lovely and it's not difficult to crochet with. If you have troubles seeing the stitches while working, just hold the crochet piece up to the light and you’ll see the stitch structure. You can also feel the stitches with your fingers. - the hand strap, worked in rows. 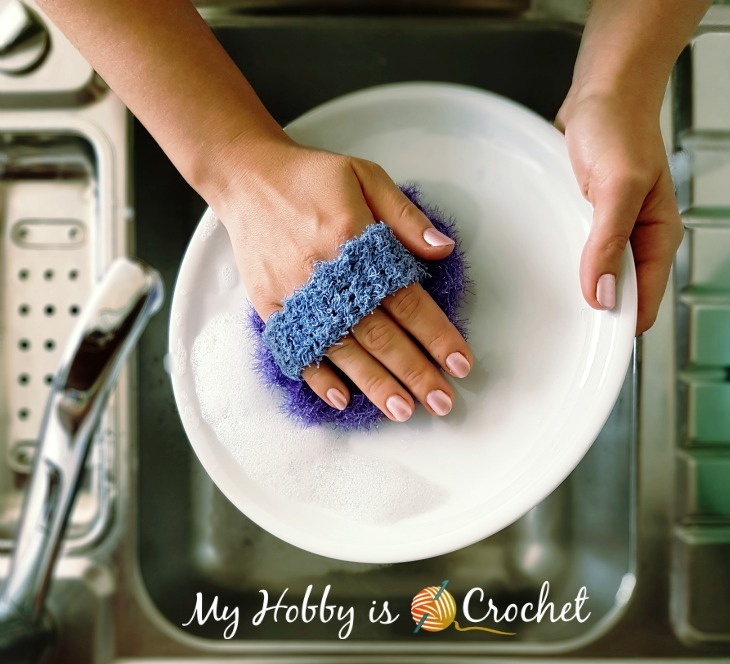 You can also leave the dahlia scrubby without the hand strap, but I found it more comfortable when washing the plates to have the scrubby attached to my palm. 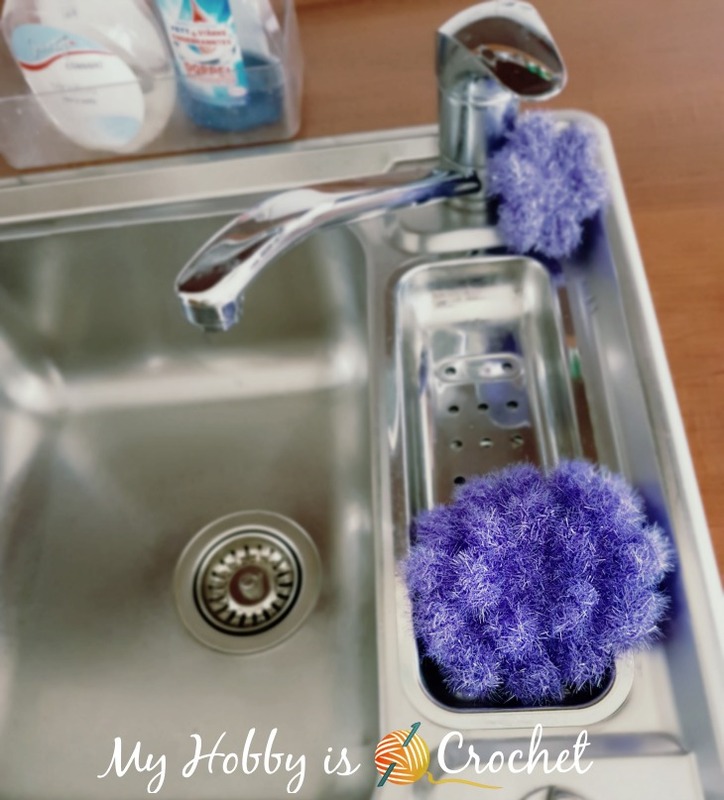 It also helps hanging the scrubby over the tap when not in use. GAUGE: for this project the gauge is not important. Just be sure to use the Scrubby Sparkle yarn for good results. 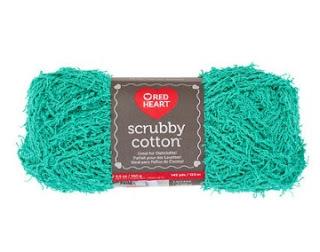 - small amount of Scrubby Cotton by Red Heart Yarns (for the hand strap). This is optional. 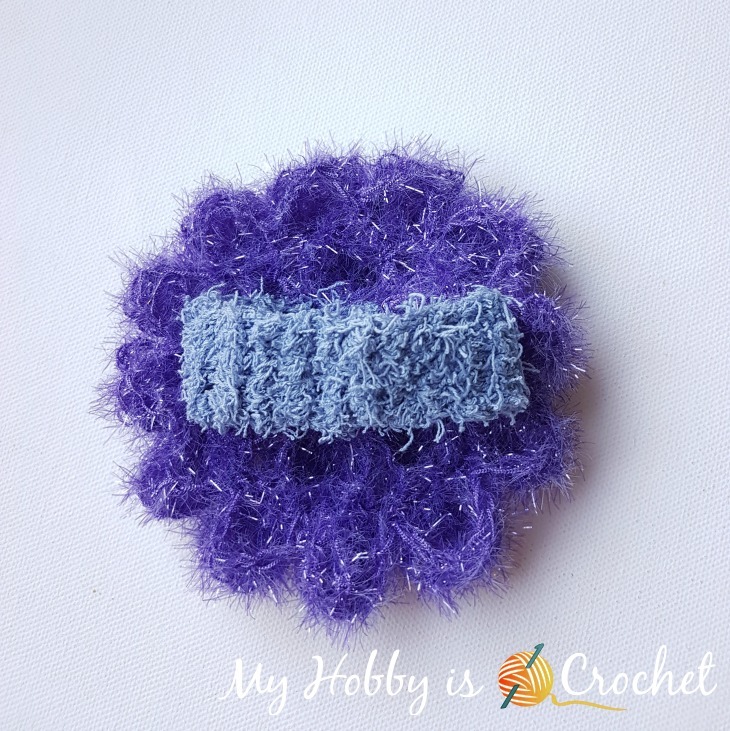 You can crochet the hand strap using Scrubby Sparkle also, but I found the strap comfier made with scrubby cotton. On the other hand, Scrubby Sparkle dries out quicker. Click on the yarns to buy them on Red Heart site! dtr or double triple crochet: Yo hook 3 times, insert crochet hook in st, yo, draw lp through, [yo, draw through 2 lps on hook] 4 times. dtr5tog or double triple crochet 5 together: [yo hook 3 times, insert hook in the stitch indicated in the pattern, draw loop through, (yo, draw through the first 2 loops, leaving the next loops on hook)x 3 times] x 5 times in the same stitch. You have 6 loops on the hook; yo, draw through all 6 loops on the hook. 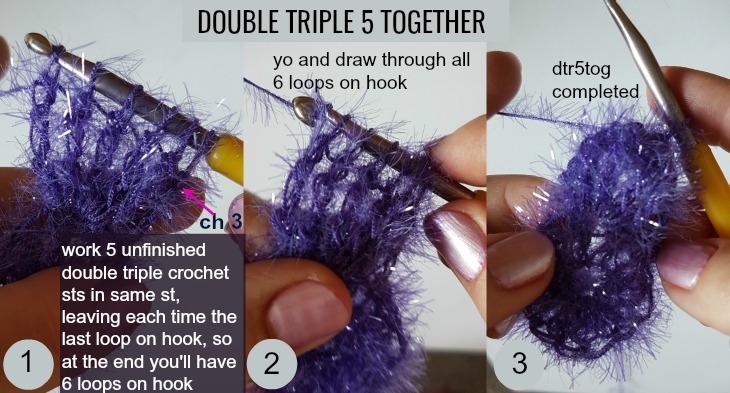 ( In other words, you will make 5 unfinished double triple crochet sts in same st, leaving each time the last loop on hook, so at the end you'll have 6 loops on hook; yo, draw through all 6 loops on the hook. Round 2 (First layer of petals): ch3, work dtr5tog in next dc, ch3, *slst into next dc, ch 3, dtr5tog in next dc, ch 3*, repeat from * to * 5 times, ending with a slst in the same st as the ch3 at the beg of round. Note: Help the petals pop out the right way, by pushing them from back to front. 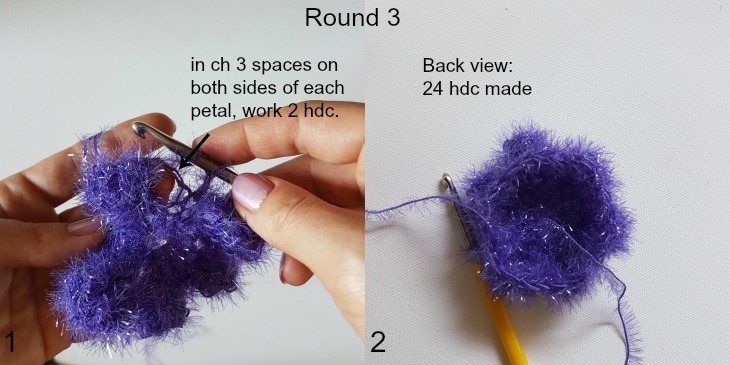 Round 4 (Second layer of petals): ch3, work dtr5tog in next hdc, ch3, *slst into next hdc, ch 3, dtr5tog in next hdc, ch 3*, repeat from * to * 11 times, ending with a slst in the same st as the ch3 at the beg of round. With scrubby cotton ch 6. Repeat row 2 until strap fits snugly but comfortably around the palm of your hand. Join the short edges of the strap together either by slip stitching them using your crochet hook, or sewing them together with the yarn needle. Cut yarn. Fasten off. Weave in all ends. 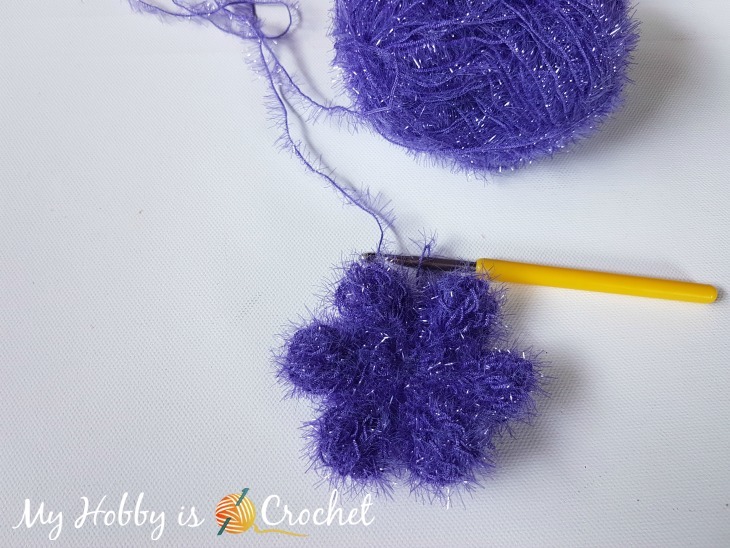 Turn the dahlia scrubby with the back side facing you. Pin the strap down across the diameter of the scrubby, so that the sides are symmetrical. Thread yarn needle with the same yarn as the one used for the scrubby. Being careful not the tack down the petals at the front, sew the strap securely to the scrubby. Share your projects and get support in our My Hobby is Crochet Community - Facebook Group! Many thanks to Red Heart Yarn for providing the yarn for this pattern!